Watermakers Reverse Osmosis Service & Parts - Ocean Link Inc.
We stock a wide variety of watermaker parts and consumables including chemicals, filters, filter elements, filter housings, strainers, and pumps to keep your system operating smoothly. Items not in stock can easily be obtained within 24 hours. We are distributors for Horizon Reverse Osmosis systems, but do have parts for other systems. Call us at 401-683-4434 for parts or service. Pioneer of Reverse Osmosis Desalination Since 1975 Horizon Reverse Osmosis (HRO) was established in 1975 and became the first manufacturer of compact, economic marine watermakers for use in the boating industry. A brilliant vision and innovative engineering allowed Horizon Reverse Osmosis to create rewarding products that benefit sailboat and power boat cruisers. HRO's marine watermakers have been copied by many, but matched by none. Today, Horizon Reverse Osmosis continues to provide quality watermakers for boats around the world and continues to make advancements in desalination technology to maintian the quality and reliability it has been known for. 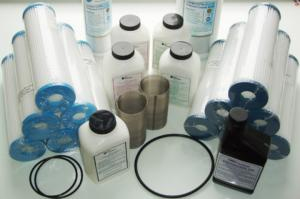 We stock or have access to many watermaker parts and consumables for a variety of brands such as Horizon Reverse Osmosis, Sea Recovery, Parker Village Marine, Spectra Watermakers, Dometic etc. Watermakers are complex systems with many moving parts. Due to the high volume of parts within each system we are unable to list every single watermaker part on our website.If you don't see what you are looking for here or require further assistance please give us a call at 401-683-4434! Parker Village Marine (VMT) develops water desalination and purification systems, offering a complete range of reliable, power-efficient watermakers for sailboats, motorboats and yachts.